Raymond Tallis’s article on Ian McEwan’s Saturday in issue 27 of The Reader magazine addresses the issue of implausibility in fiction. It is interesting for a start that Tallis picks the word ‘implausibility’, rather than something more definite such as ‘accuracy’ or ‘truthfulness’, because whether or not you find McEwan’s novel plausible depends very much on what you know or think you know. Whether the novel is truthful in a broader sense goes way beyond being able to verify the extent to which it is factually correct. Here are some thoughts and some links around the issues raised by Tallis’s Reader 27 article. McEwan’s novel was published in 2005 and features Henry Perowne, a neurosurgeon on his day off. This Saturday also happens to be February 15, 2003, the day of the anti-Iraq War demonstration in London and elsewhere. Tallis’ 35-year medical career included, he tells us, treating patients with Parkinson’s disease, epilepsy and stroke. So when it comes to scrutinising McEwan’s background research, he’s no slouch. Tallis lays out his stall with a nod to Roland Barthes’ mockery of the ‘”secretarial realism” of writers such as Balzac’ and declares that ‘getting things right must be better than getting them wrong’. But must it? Tallis’s critique of Saturday is not, as you might think, an attack on weaknesses in McEwan’s research. It seems like it might be, but it isn’t. With the exception of Perowne operating on his assailant’s brain under the influence of alcohol, Tallis is disturbed by the inanity of the plotting, first and foremost. As it turns out, Tallis’s 35 years in medicine are not really the issue here, but his need to believe in specific moments rather than what Edgar Allan Poe called the ‘totality of effect’. I happen to agree with Tallis about many of the weaknesses in McEwan’s plotting, that the novel has been overrated by the critics (though not all) and also with his view that it is a ‘polished failure’. It is implausible that a Victorian poem read by a naked girl could calm a violent criminal. Implausible too is the idea of engaging with a hardened and threatening criminal on the subject of his brain defect and living to tell the tale. Less so however that an engrossed and single-minded professional should continue to think from inside his training when confronted by an attacker. Isn’t that where the stereotype of the absent-minded professor comes from? Where I disagree with him is in the view that implausibility matters, even in a realistic novel. Saturday is not a manual of neurosurgery, a psychological treatise, or a report on street violence and the criminal mind. It is a novel, made to create sensation, to generate thought and feeling and yes, disturbance. Though she did her writing a long time before Balzac and Barthes, Jane Austen knew this. As Catherine Morland finds out in Northanger Abbey, reading novels as if they were a guide to reality is bound to end in disappointment; and that also applies to Northanger Abbey itself. What I find surprising is that after 200 years we are still arguing about it. 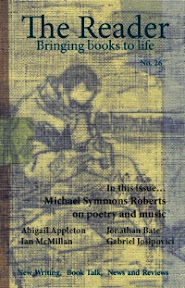 Read Raymond Tallis’s article in Reader 27, which you can buy here. Chris Routledge is co-author with Siobhan Chapman of ‘Reading “Great Books”: Non Truth-Committed Discourse and Silly Novel Readers’. Forum Modern Language Studies, 2003; 39: 1-14. It’s not as straight-forward as drawing a line between memoir and fiction though, is it? Surely a writer has only their own experience to draw on? Yet Coe says, “Writing allows you to get into a perspective different from your own”, even if it isn’t your ‘real’ perspective – the perspective that you have attached to your sense of identity – how could you possibly write (convincingly or otherwise) about something you have never experienced, seen, read, heard or touched. Is it a question of interpretation? When in ‘character’ an author is able to position themselves in a different mode of interpretation, to imagine a different response from normal but at one and the same time there must be the realisation that this interpretation has also come from within, from knowledge and experience. Reading is then another form of interpretation. Issue 27 of The Reader features an essay by Raymond Tallis on Ian McEwan‘s Saturday, it also discusses the position of the contemporary novelist and the aim of literary fiction, “to leave a more lasting and different kind of impression” rather than just giving readers a “rat-a-tatting good read”. Coe made a pertinent comment about the relationship between reading and writing, “You don’t realise what book you’ve written until people read it”, interesting when you consider the extent of readerly interpretation on bringing the book to life. Thoughts in the author’s mind are deciphered into words on a page, those words are then unravled in the reader’s mind, with their own set of experiences construing a meaning. Authors interpret our world in their fiction, we interpret their fiction in our world. Victoria’s own interest in this area was helped along by Professor Stuart Sutherland, who headed the Experimental Psychology department at Sussex University and told his students repeatedly that ‘literature, not psychology, held the key to human nature.’ You can read reviews of his memoir of his own manic depressive illness here. And if you are interested in learning more about the world of poetry therapy, you might find Victoria’s book, ‘Writing Works – A Handbook of Therapeutic Writing Workshops and Activities’ a useful resource. Click here to read more about the book. Read more in The Reader magazine. Back in July we highlighted Poppy Shakespeare by Clare Allan as one of our ‘recommended reads‘ (To read the recommendation click here) Publishers Bloomsbury have been good enough to offer us three copies of the book to give away free to the first three people to take out a year’s subscription to The Reader magazine. Simply click here to register for a one year subscription and if you are one of the first three people to subscribe, not only will you receive four issues of the new look Reader magazine, packed with recommendations, reviews, poetry and fiction, you will also get a lovely copy of Poppy Shakespeare sent straight to your door. Thank you Bloomsbury! Read more of our Recommended Reads here. The Reader 27 has landed! In Issue 27, The Reader tries for happiness and we couldn’t be more happy that it has arrived so we can share its delights with our subscribers! The collection of stories, poetry, essays and recommendations in this issue focus on moments of joy and simple pleasure, moments that we should try to capture and remember how important they are to our lives. This is also the first issue of The Reader with Phil Davis as editor, taking over the helm of the magazine from his wife and colleague Jane Davis. It is an exciting time in The Reader office, lots of changes are afoot – a new design for the magazine, extensions of The Reader‘s outreach projects – yet the magazine’s heart and soul remains concerned with the human content to be found in literature. That will not change. You can read Phil’s editorial here. Highlights in this issue include poetry by Omar Sabbagh, a young new poet we’re thrilled about publishing, reading his poems makes you aware of the solidity and lightness of life. There is also poetry by Tom Paulin, R. S. Thomas, Martin Malone, Sean Elliott and Andrew Shields. 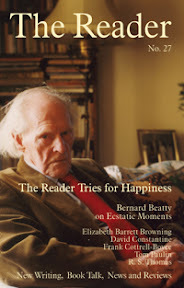 Bernard Beatty writes an animated essay on ‘Ecstatic Moments’ and Josie Billington focuses on the late love of the Barrett Brownings. David Constantine and Jo Canon provide us with some great short stories in which the chance of happiness in glitteringly present and real but is often transient. You can read more about this very full issue on The Reader‘s website. To subscribe to the magazine and read it all for yourself, click here.